The Southwest Transitway is a high-speed roadway for buses, physically separated from the regular street system. All existing bus routes in Southwest Winnipeg will be able to use the transitway to travel to and from downtown faster. Buses operate at speeds up to 80 kph, free of any other traffic, providing very fast, reliable service. Check out this great “drone video”, capturing an aerial flyover over recent construction activity on the new transitway in the Southwood lands (University of Manitoba). Several photo galleries of the construction to date can also be found below. Click on any image to open the gallery. Construction will continue over the winter, linking the Transit Station via a pedestrian bridge to the Investors Group Field stadium. Once Stage 2 is completed and opened for service in 2020, the Southwest Transitway will operate from Downtown to the neighbourhoods of Southwest Winnipeg, including the University of Manitoba. My thanks to the Winnipeg Free Press for reporting on this project. A portion of the new southwest transit corridor has been built through the former Southwood golf course lands, connecting to IGF Stadium. Transit director Dave Wardrop told Thursday’s finance committee meeting this is the first section of the southwest corridor to be completed, adding this piece of the project was a top priority leading up to the Canada Summer Games in July, where the stadium will be the site of many events. “Construction is well underway with the early focus being between the University of Manitoba and Pembina through the Southwood golf course,” Wardrop said. The controversial project was the recipient of some positive financial news this summer when consortium chosen to build the project said it was able to lower the total cost from the estimated $587.3 million down to $467.3 million – a savings of $120 million – through a series of design revisions. Plenary Roads, the construction consortium, has guaranteed the final price and is responsible for any cost over-runs. The lower project cost will reduce the city’s annual payments for its share of the project from $20 million to $14 million, which will begin in 2020 and continue for 30 years. Construction of the corridor is expected at the end of 2019, with full operation by the spring of 2020. 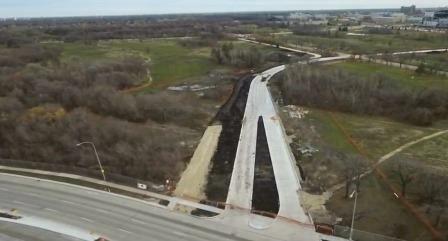 The first stage of the southwest transit corridor, completed in 2012, cost $138 million. The second stage will connect to the existing corridor at Pembina Highway and Jubilee and will complete the first transitway linking downtown to the U of M campus. Wardrop said the stretch of the corridor between Pembina Highway and the stadium is essentially finished. Footings have been installed for a pedestrian bridge that will link one of the stadium gates with a new transit station and transit loop. Winnipeg Transit has posted a video of a drone flight along this corridor section on its website. Wardrop said while the rest of the corridor hasn’t been constructed, Transit buses will connect to the U of M property where the corridor exits the former Southwood golf course property. Wardrop said it might be necessary to install temporary traffic signals at that location to facilitate southbound buses turning into the university grounds, which will be used during CFL games, events connected to the Summer Games and other stadium events. Wardrop told the committee the Pembina/Jubilee underpass portion of the project is still estimated to cost somewhere between $70 million to $100 million (the original estimate had been $72.5 million), adding the exact cost is considered proprietary information belonging to the construction consortium. However, that still results in a price for the transitway corridor (and the related stations and grade separations) itself to fall somewhere between $367.3 million and $397.3 million. Once the contingency of $69 million is removed, the final cost of the transitway portion could range between $298.3 million and $328.3 million.